Let’s start on a positive note, I’ve trying to write a review on this since I got it and always failed. Nice, hein?! 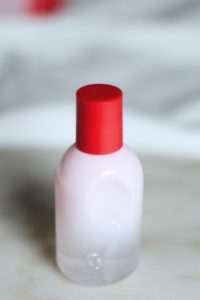 Everytime people asked me what Glossier’s first fragrance You smelled like, I always babbled something that I could distinct at that moment and then finished with a “but it’s difficult to explain”, still to this day I don’t know what You smells like, but what I know is that I bloody adore it. 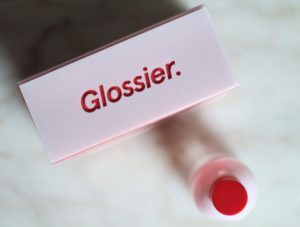 This became quickly one of my favourite fragrances of all time, I visited the Glossier’s pop-up store in London I remember don’t knowing what I expect at all because some fragrance bloggers that I follow didn’t like it and others loved it! I remember going upstairs in the pop-up store, and immediately being drawn by the smell to the You red dark room where I was invaded by this cloud of this subtle, sophisticated yet somehow addictive, sensual fragrance. I do find notes are so irrelevant on this one but let’s talk about it shall we? Also I’ll try to describe it – put your seatbelts on! If I would need to describe it I would say this is like a woody metallic musk – don’t laugh! – it has something metallic about it I guess it’s probably the ambrox, which adds the salty component that smells slightly “metallic, then woody musk due to the musk and ambrette which makes it feel comfy and addictive. I can’t say it I can smell the pink pepper, I don’t think it’s sparkling at all – like most of fragrances which contain pink pepper, that almost bite. It is very so slightly floral on me, a very subtle faded floral, that probably comes from the iris root note. This somehow reminds me BYREDO’s Mojave Ghost in the sense that is ethereal, subtle yet addictive and there, it’s the same style so if you like Mojave Ghost you will definitely like You. Hopefully now I made more sense than the thousand times that I tried to describe this scent to someone!